Resaw machines are basically a large band saw that uses a thin, wide blade that moves continuously in one direction to cut lumber lengthwise along the grain of the wood. Unlike a typical band saw, these saws are designed to straight cut lumber only. These machines can be used to cut logs in half, but can also be used for smaller jobs such as cutting boards in half lengthwise. This can be handy if you want thinner boards, but what practical application do resaws have to offer? Resaws are used in shops to cut thinner boards to be used as flooring, roofing, etc. These machines are also capable of cutting very thin layers from boards and logs to be used as veneer. Besides cutting the lumber to the desired width, the sawing machine can be equipped with a special blade with some teeth bend inward toward the cutting surface which is used to cut along the woods surface, leaving it with a rustic look. This blade does not cut more than 1/8th of an inch off the woods surface and is not designed to cut lumber thinner like typical resaw equipment. The blade still runs along the board widthwise, however. Now, the practical application of such a sawed board may not be obvious. These rustic looking boards can be used for flooring, inside walls, and ceilings to give the inside of a home or building a certain rustic look that many people find appealing. Resaws typically look like an oversized band saw and are equipped with a thin blade, mounted on 2 or more powered wheels, that is wider than a standard band saw blade and designed to make long straight cuts through lumber. The blade has a small kerf, or cutting width, which cuts most efficiently by removing the smallest amount of wood from the lumber while being cut, thus minimizing waste. The lumber can be fed into the saw either manually or by way of a conveyor system or power feeder. The thickness of the lumber to be cut is controlled by adjustable guides to ensure the uniformity of all cuts made. Hi everyone. I wonder if any of you can be in help? At the moment I am using the carba – Tec 21. bandsaw. But I am looking out to upgrade to something more powerful a workhorse that can resaw 8-9 hours a day and at least 5 days a week need something that is professional and very accurate as we are cutting musical instruments timbers to 4mm thickness. I have been told the the resaw bandsaws made in Europe are the best but I need more advice where to look. Thank you. A Resaw is a great piece of equipment for taking squared up cants and turning them into pallet boards. A resaw is designed with speed and efficiency in mind. It normally takes two people to effectively run a resaw to its full capacity. One person feeding the resaw from the incoming side and another person to offload the cut board and return the cant back to the front operator for another pass until the entire cant is processed. 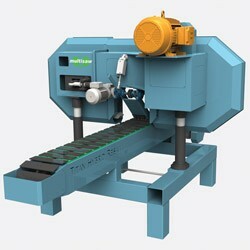 The low profile Resaw is setting a high standard in the Resaw industry. Its low profile design has many advantages over traditional overhead style Resaws, such as the Bandsaw blade height adjustment. A Resaw is a large band saw optimized for cutting timber along the grain to reduce larger sections into smaller sections or veneers.